President of the Senate, Dr. Abubakar Bukola Saraki on Sunday expressed sadness over the death of Mrs Fatima Abubakar Sani – the mother of the Senator representing Kaduna Central Senatorial District, Senator Shehu Sani at the age of 75 years. 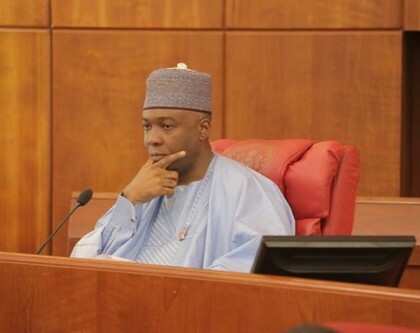 In a statement signed on his behalf by the Special Adviser, Media and Publicity, to the Senate President, Mr. Yusuph Olaniyonu, Saraki said Mrs Sani has left a vacuum that would be difficult to fill. “We mourn a great woman and a role model who lived her life in the service of God and humanity,” Saraki said, while urging the children to emulate the virtuous legacies of patience, courage, compassion and selfless service left behind by their mother. The Senate President condoled with Senator Sani, the bereaved family and the government and people of Kaduna State over the incident and prayed Almighty Allah to grant them the fortitude to bear the loss. He also prayed Allah to grant the soul of the deceased a place in aljannah fidaus.